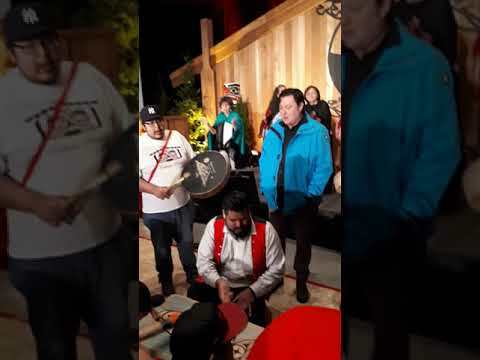 The Nuu-chah-nulth Tribal Council is sad to learn of the passing of friend Ian Hinksman, and we send our heartfelt condolences to his extended family and friends at his loss. Ian, who left us on June 23, worked over his lifetime on behalf of Aboriginal people, despite many personal challenges. He was a fierce advocate, particularly for urban Aboriginal people. He co-founded the BC Aboriginal Network on Disability Society, was president of the Victoria Native Friendship Centre, president of the Victoria Native Housing Society (now the M’akola Housing Society) and was president of the BC Association of Indian Friendship Centres. We acknowledge Ian for all of that good work. He received the Meritorious Service Medal (Civil Division) on April 12 of this year from Lt. Gov. Judith Guichon on behalf of Gov. Gen. David Johnston. At that ceremony, his long-time friend and co-worker Florence Wylie, NTC Executive Director, spoke about Ian’s contributions, describing him as a man of integrity, compassion and determination. He was fearless and forceful when dealing with any obstacle, and earned the respect of First Nations leaders in B.C. and across Canada. He was stricken with Guillain-Barré Syndrome in 1987, which paralyzed Ian from the neck down, and hospitalized him for many months, but he continued on determinedly as president of VNFC, arranging with staff at the George Road Hospital to hold their meetings in the cafeteria. His disability enlightened him to new struggles, and steeled him for new battles with service agencies, identifying gaps in supports and services. Ian presented to the Royal Commission on Aboriginal Peoples on barriers and obstacles faced by urban First Nations people with disabilities. A grant from the RCAP led to a survey in collaboration with UBC, which then led to a provincial conference which brought First Nations people living with disabilities together with federal and provincial governments and First Nations leaders. This conference led to a mandate to develop a society focused on improving the quality of life for First Nations people living with disabilities, and the BCANDS was born. Ian was invited to speak to the House of Commons Standing Committee on Persons with Disabilities and national conferences on mental health, drug and alcohol use. He was part of developing the HALO Project, providing personalized training and support to First Nations people with disabilities to enable their participation in the labour market. Through Ian’s advocacy, NTC developed its own Disability Access Awareness Committee in 1997, which remains active to this day. Its six-member committee is comprised of individuals who each live with various forms of disability and challenges.